Advantages: A detailed look at Hornet Operations from the Eastern Med during OIF. When looking at the Coalition bed-down statistics for major combat operations during Iraqi Freedom it becomes clear that significantly more F/A-18s were deployed into theatre than any other tactical aircraft. The reasons are varied from denial of basing rights by countries surrounding Iraq, withdrawal of the F-14 Tomcat from service to the ability of the F/A-18 to deploy a wide range of J-weapons including JDAM and JSOW. Operating from carriers in the Eastern Mediterranean and Persian Gulf as well as from Kuwait and other unacknowledged countries, the F/A-18 carried the lions share of the air war in Iraq, providing everything from Combat Air Patrols, interdiction, and tactical tanking to close air support for both US Army and Marine manoeuvre units, British Army and Special Forces units. Following on from his volumes on US Navy Hornets fighting the Southern war and Tomcat Units in OIF, author of this volume is aviation journalist and Osprey Combat Aircraft Series Editor Tony Holmes. Tony, an Australian based in the UK, has written extensively on the subject of US Naval Aviation in both journals and books and is sufficiently well connected to make this volume a worthwhile addition to the written history of the OIF air war. This is of course part two of an eventual three part series which will eventually cover US Marine and Coalition (namely RAAF) Hornet units. 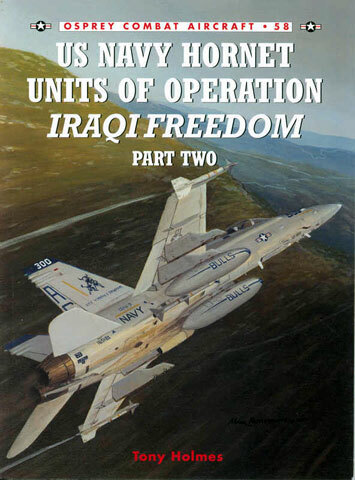 The principal focus of this volume is Hornet operations in the Northern War, where carrier aviation took on the bulk of tasking after the denial of bases and overflight rights to US land based units late in planning of OIF. This volume follows-on from Part One and as such does not go into detail on the background to the conflict or preceding operations the way other volumes in this series does. Holmes limits the introductory material to setting the scene for US carrier ops in the Med and the work-ups of the two wings, CVW-3 and CVW-8 which flew from the USS Harry S Truman and USS Theodore Roosevelt respectively. Also addressed is the mobilisation of VFA-201, which went to war as the first US Navy Reserve Squadron to be deployed for active duty since the Korean War. 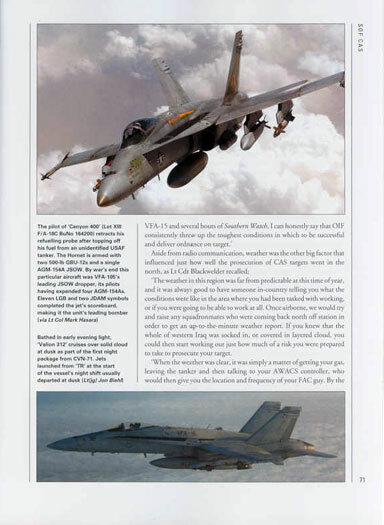 The remainder of the chapters deal successively with “Shock and Awe”, the strike campaign of the first few days, “Special Operations Force CAS” the meat of the book, and finally “The Hunters War” built around the war diary of a US Navy LTCDR who flew with VFA-201 during OIF. As is usual for the Osprey Combat Aircraft series included in this volume there is a useful appendix covering all the units which have operated the Hornet from the Med (five in all) including BuNos and assigned Modexes. 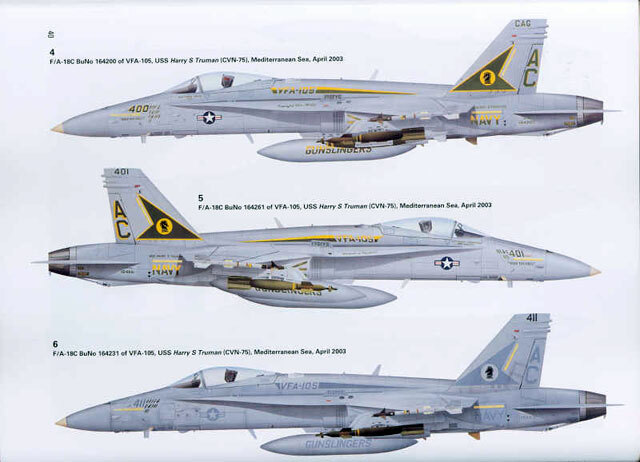 12 colour profiles of Hornets from all five units fill the centre pages, supported by 7 scrap views highlight tail art and mission log details as applied to the aircraft. Modellers are well served with the photographs and aircraft details which would support an accurate model of an OIF Hornet. The captions also contain a wealth of useful notes, including discussion of various ordnance loadouts carried by different squadrons, always useful to finish off an accurate replica. The majority of included photographs are small, but in common with many of the volumes on recent US subjects, includes a generous amount of colour. The rarity of the photographs, many taken by serving members in theatre is itself a reason to purchase this book. Yet again Osprey has published an excellent volume on a topic of interest to many.